Below are the events for the next 5 weeks. For a full Calendar please click here. Nothing from April 19, 2019 to May 24, 2019. School will re open the week of August 28th. 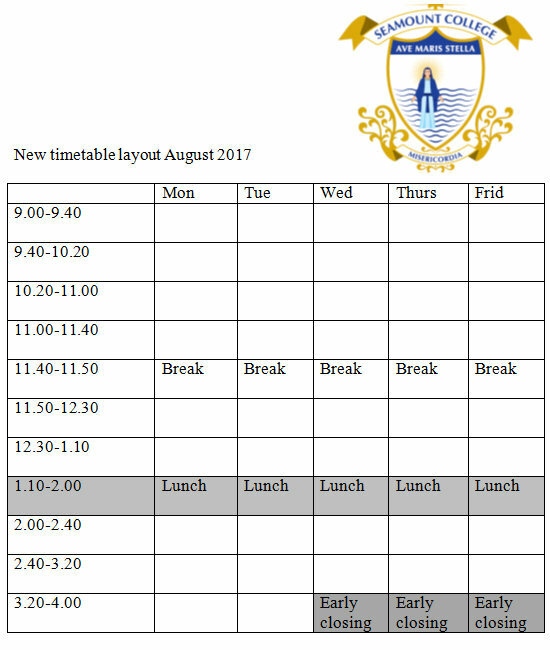 We will welcome our new 1st years on Wednesday 30th August at 9am. Bring a packed lunch as only students who live locally and who bring a letter from home stating that they go home may leave the school at lunchtime. School will end at 3.20pm. Please use the back entrance to the school. In line with Department of Education and Skills guidelines all class periods must be of at least 40 minutes duration. This is to facilitate new teaching methodologies in the new Junior Cycle Programme being introduced. After consultation with the Staff, the Student Council and the Parent’s Council a new layout to our school day has been agreed and adopted by the Board of Management. A copy of the new layout is attached. This will be tested for the coming academic year and will be reviewed again next May. Wishing all our school families an enjoyable summer break. © 2016 Seamount College Kinvara. | All other rights reserved.